This morning I tried out the Metaverse augmented reality game, which might or might not still be in beta, depending on where I read about it. In this game, you wander around looking at a map on your phone. 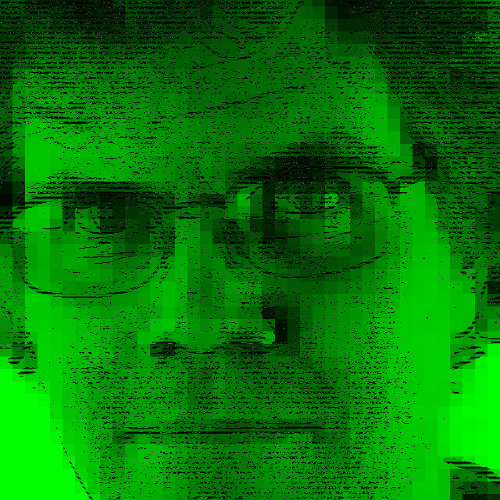 There, you might see things you can interact with. 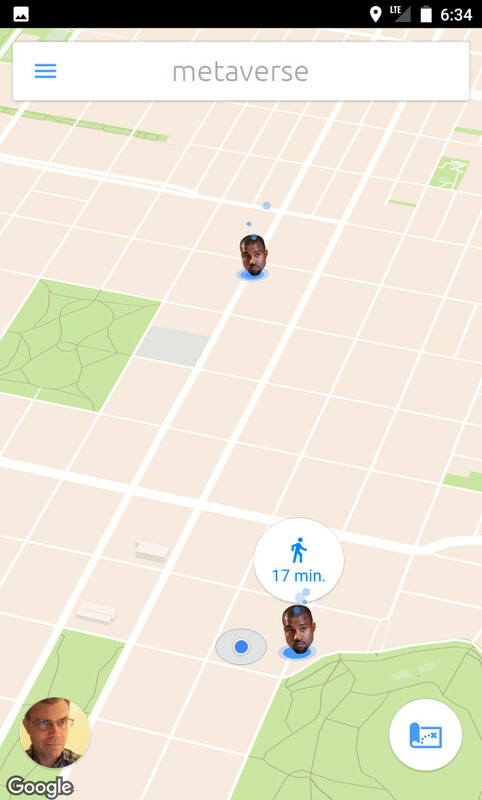 There weren't any of those near my apartment; but I hopped on a bus, rode around until I saw a Kanye West head show up on the map, and then hopped off the bus so I could play with the head. To play, I needed to get kinda close to the Kanye head on the map and then tap it. Unfortunately, the game expects you to get pretty close to the head, and this was a "bouncy" neighborhood for phone location-finding. After some frustrating minutes walking up and down the same stretch of sidewalk, I eventually convinced my phone I was in the right place. 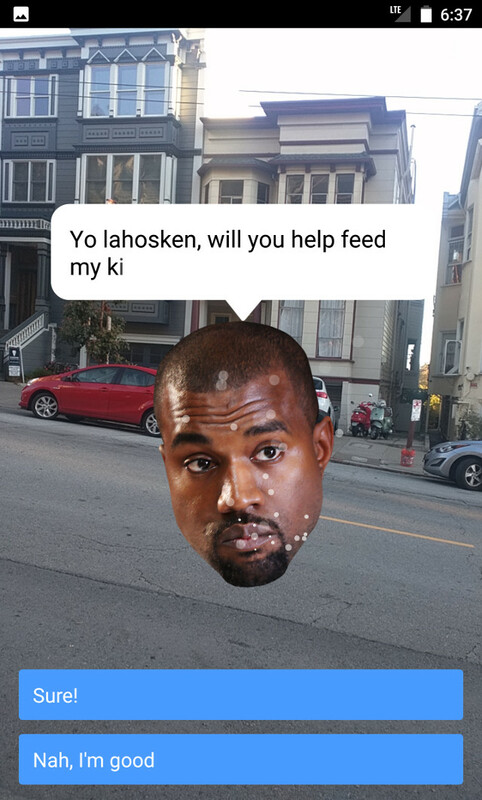 When I clicked the map's Kanye West head, my phone switched to an augmented-reality-camera view where the giant head of K.West gave me a quest (get it? ): to help feed his ki(tty). Kanye sent me off to find T.Swift, who had cat food. Looking at the map again, there weren't any Taylor Swift heads in evidence. There was another Kanye head. As I walked closer to it, moving across the map, I spotted a Taylor Swift head. After taking a couple of minutes and then giving up on trying to convince my phone I was near the second Kanye, I made my way over to the Taylor Swift head. There, I got cat food. I suspect that the eventual plan is for me to bring the cat food back to Kanye. In the game, my character has an Inventory, now with cat food. When I re-visited Kanye, he didn't realize I had cat food—he just re-asked me to go get some from T.Swift. I liked that this game has a quest mechanic, one that has me walk around rather than stay in place fiddling with my phone. I didn't like that the game expected me to get so close to places of interest, closer than is easy in a "bouncy" area. And I suspect the game is still in beta; I suspect that's why my character still has that cat food. Anyhow, this game shows promise.